As I prepare my final report, I can’t help thinking how fast nine months have gone by in Yida. I have enjoyed learning about the people of Nuba, their culture, history, MSF's work, ISYSTOCK (pharmacy stock management software), pharmacy stuff, and, more importantly, myself. As I prepare my final report, I can’t help thinking how fast nine months have gone by in Yida. I have enjoyed learning about the people of Nuba, their culture, history, MSF's work, ISYSTOCK (pharmacy stock management software), pharmacy stuff, and, more importantly, myself. Even with the limited resources and opportunities available, the people in Yida are still very enthusiastic and hopeful for a better tomorrow. They appreciate any opportunity for learning and growth and take great pride in contributing to the betterment of their community and society in general. I found some of the people did not like to be tagged as "refugees," but have no choice if they have to choose between being alive in a safe environment versus the war zone in the Nuba Mountains. I arrived in Yida with an open mind, ready to learn and also serve the people to the best of my ability. Practicing pharmacy in this setting is different from what I did in the United States and requires a complete shift of mindset. But the bottom line remains the same: access to quality medical supplies and no shortages for the project!!! I had two staff members that I worked with permanently and another staff member that I worked with remotely. These people know the project better than any international staff member, even with their limited formal education, so we [the international staff] just provide some technical expertise and a clearer picture of how things should work. But they are the constant team running the project while the international staff rotate or change every few months based on their availability. 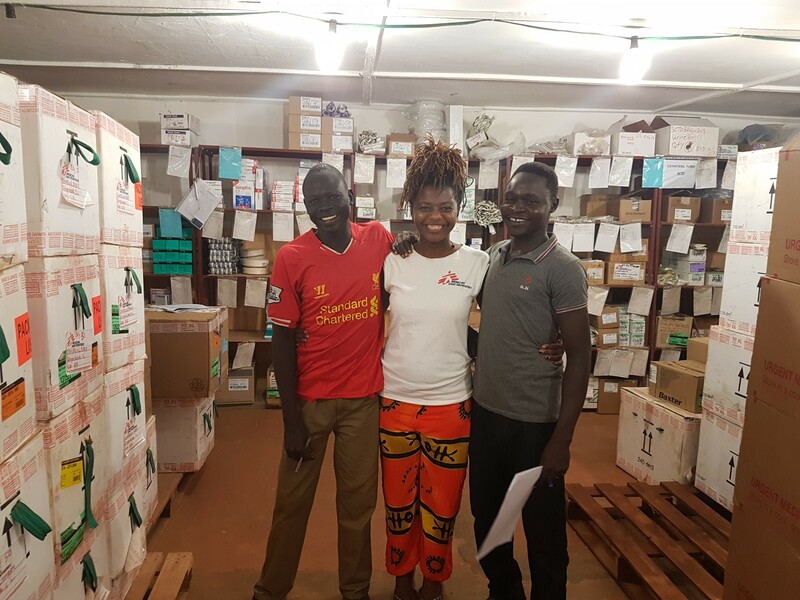 Adjago and Francis are the two Yida pharmacy staff members supporting all the MSF facilities. When I arrived in Yida in January 2016, the project was operating as two separate projects, with one supported remotely. This continued until April, when the project was combined into one called Nuba Project. Though it’s now one project, the location is different, the context is different, activities are different, and resources are different. This makes the project even more challenging and complex, and means that it requires a lot of attention. The goal was to decentralize basic primary health care services within the Nuba Mountains to serve the population cut off from any sort of health care. As I leave, I pray the medical supplies continue to reach this remote population. I plan to take a break until next year and then will decide what’s next for my humanitarian work. It has been a pleasurable and empowering mission working with both the expats and national staff in Yida, South Sudan!